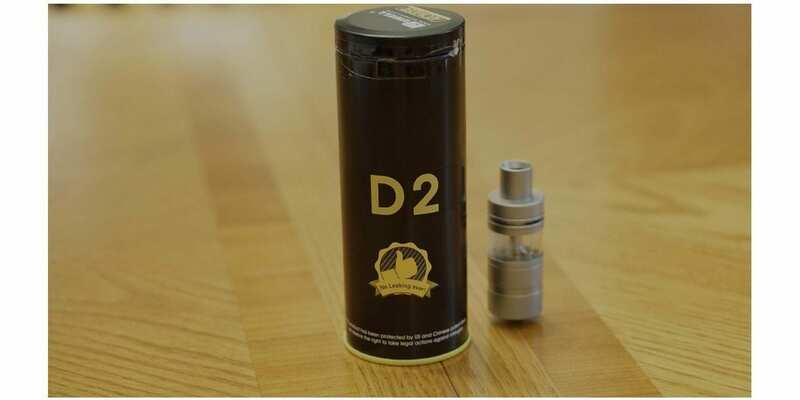 Uwell D2 RTA Review - Daily Vaping Deals & The Best Vape Product Reviews at Vaping Cheap! Uwell is known for their original Crown tank. Many vapers loved this tank due to its excellent performance and outstanding coil heads. It had a great amount of airflow, and the coil heads would provide solid flavor and last for weeks. However, more and more vapers have gotten into rebuildables, and so Uwell has now entered the rebuildable tank market with their recently released D2 RTA! Firstly, I want to thank Fuggin Vapor for sending me the Uwell D2 RTA for the purposes of this review. I will go over my first impressions of this tank, how it is to build and wick this RTA, its overall performance, cons, and conclude by telling you whether or not I recommend this atomizer! Check out the Uwell D2 RTA Here! Click Here to Check out the Uwell D2 RTA! One of the first things I noticed when I first received this product was the familiar packaging. Most, if not all new Uwell products come in a tube like packaging, which I like since it is different than an ordinary box. Upon taking off the top cap of the packaging, out slides the Uwell D2 RTA, and it’s protected by thick bubble wrap. This is definitely a good thing, since you know your atomizer is well protected when it’s out in transit. The color I received is matte stainless steel, but I do know there are other colors available such as matte black and a matte coffee color. I do like the way the matte stainless steel looks, it’s much different than any other atomizer I currently own. Something else I noticed right away is how tall this tank is. This tank is certainly taller than some of my other tanks, and this may be seen as a con to some. However, I personally did not find this as a con. In addition, the D2 has some sort of knurling design, which I think looks great. I definitely applaud Uwell for taking a different approach when designing this tank, as it looks completely different than most tanks on the market. What I noticed as well was the dual glass design. It seems like the inside glass would hold the e-liquid, and I wasn’t sure what was the point of the outer glass. 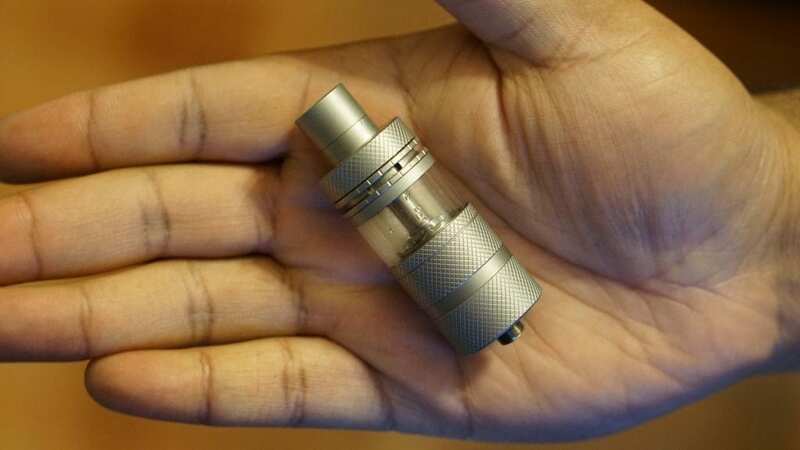 It looks great in my opinion, but honestly I don’t see a point to this RTA having two glass tank sections. In addition, the airflow control is kind of hidden, since it is top airflow. It is really easy to find and adjust, which is definitely a pro. The same can be said with the top fill design, it really is easy to unscrew, and really only takes about a half or three quarters of a turn to open. Also, all of the threads were smooth. Honestly, the quality of this RTA was stellar! The drip tip included is a heat insulated 510 drip tip. You can use your own preferred 510 drip tips, but due to the way it’s designed, some 510 drip tips may not look the greatest. 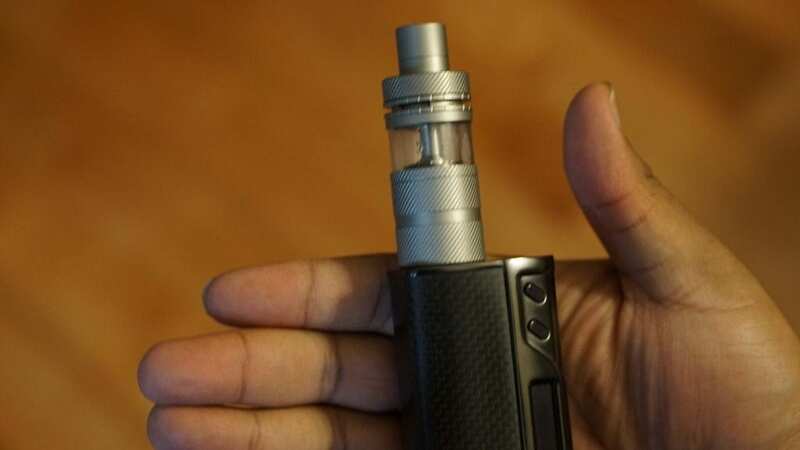 Where the 510 drip tip sits, it is not flush against the tank, and it is slightly raised; hence is why certain drip tips may not look the best. However, the included 510 drip tip seemed to be just fine for me. I usually prefer wide bore drip tips, but I would say this tank is bit more focused upon flavor rather than vapor production. Included in the packaging, you do receive an 2 extra glass tank sections (the inner and outer glass tank sections), cotton, extra screws and o-rings, a sticker and a user manual. I was happy to see that they included 2 extra glass tank sections, so if you lose one or break one, you have an extra. That’s always a pro in my opinion. I do want to mention that the Uwell D2 RTA did not come with any machine oil at all, and was ready with just one wash with hot water! This is definitely a pro in my book, as I do hate when atomizers come drenched in machine oil. All in all, my first impressions of the Uwell D2 RTA were all positive! The overall quality of this RTA is solid, and it just looks great! In the next section, I will go over building and wicking the Uwell D2! The Uwell D2 RTA features a 2 post velocity styled build deck, so installing coils on this atomizer is quick and easy. The way this tank is designed is different though, the build deck does come out, and you first attach it to your mod to start building and installing your coils. Some may find this as a con, but honestly I didn’t mind it. The way you would build on this RTA is similar to the Modfather RTA. The build deck is quite small though, so I would say bigger coils may not fit. If it does, it would probably be a bit more time consuming. However, normal Clapton coils fit with no issues. This can also be seen as a con since some vapers love larger exotic coil builds. Wicking this atomizer is a bit different than traditional RTAs as well. The way this RTA is designed is that your e-liquid feeds from under the build deck into your cotton and then into your coils. So the way you wick the Uwell D2 RTA is to lay cotton right on top of the wicking channels. You do not want to stuff cotton, as this would certainly cause wicking issues. All you have to do is fluff your cotton, and barely have the cotton cover the wicking channels. I found this to be the best way to wick this tank. I would say it is slightly more difficult to wick than normal RTAs, but overall not too difficult. If you’re experienced with wicking different atomizers, then wicking this won’t be an issue. For beginners though, they might end up putting too much cotton or too little cotton. Just like any RTA, you have to find just the right amount to have the most efficient wicking. All in all, building and wicking the Uwell D2 isn’t really that difficult. However, like stated previously, beginners may have a tough time with wicking, but with some practice you’ll be able to wick it with no issues. Experienced users will have little to no issues with this RTA. Now, the most important question is how does the Uwell D2 perform? Honestly, it performs great! Firstly, I will go over my preferred coil build for this atomizer. The coil build that I favored most in this RTA was a dual Clapton coil. The resistance of this build was about 0.3 ohm, and I would vape this RTA with this specific build between 50w and 65w. I found that with this build and wattage setting, I got the most satisfying vape experience. However, I did test other builds such as simple round wire builds, and they performed great as well. I just prefer Clapton builds due to the increased flavor. Speaking about flavor, the flavor on this RTA is absolutely amazing! The flavor is definitely way above average, and I was surprised by how good the flavor was, especially considering how tall this tank is. The airflow on this tank is slightly restricted, so if you like more of a restricted lung hit then you will love the airflow on this tank. However, if you’re a vaper who loves wide open airflow, then you might not like this RTA. For me, this airflow was perfect wide open as I do prefer a restricted lung hit. If you closed the airflow, it increases the flavor even more, but the airflow was a bit too restricted for me. Like said previously, adjusting the airflow is extremely easy, which is definitely a pro. With my preferred coil build and wattage setting, I got a nice warm vape with the airflow fully open. In addition, the airflow is nice and smooth. I do want to mention that you can take off the outer glass, and it would make the airflow slightly more airy, but honestly I left it on since I much preferred the airflow with both glass tank sections installed. So, if you do want a touch more airflow, you can take out the outer glass, but then the tank does look quite awkward in my opinion. The vapor production on the Uwell D2 was also great, but this tank is not a cloud chasing RTA by any means. In my opinion, this tank is more focused upon delivering excellent flavor rather than massive clouds. The drip tip was also quite comfortable to use. I did not notice it getting hot during vaping, so that’s a good thing. However, it is constructed of same material as the tank, so it did take some time to get used to. I do wish this tank came with a delrin drip tip, as this is something I prefer. Regardless, the drip tip was still comfortable to use. This RTA had no issues keeping up with chain vaping as well, which was definitely a pro. Once you wick it like I said in the previous section in this article, you will have no issues with wicking. It does go through e-liquid quite quickly though with a Clapton coil build, which is to be expected, but still worth mentioning. Thankfully, filling this tank is easy and can be done quite quickly with its top fill design. The Uwell D2 RTA does have a 4ml e-liquid capacity, so you won’t be filling too often. With any top airflow tank, you can expect zero leaking issues. I carried it with me all day in my pocket, and not even a spot of e-liquid leaked out through the top. This is always a pro about top airflow tanks, and is one of the reasons why I am taking these types of tanks out with me during the day rather than a bottom airflow tank. All in all, the performance of the Uwell D2 RTA was solid! The flavor on this tank is amazing, and the airflow was perfect for the way I prefer to vape. Even though this tank is an excellent performer, there are still some cons to be mentioned! The first con to be mentioned is the size of the build deck. Honestly, with the size of this tank you would expect a larger build deck, but that’s certainly not the case with this RTA. In addition, you have to take out the build deck from the rest of the RTA to build and dry fire your coils. This is not a huge con, but still worth mentioning as some vapers may not prefer this. The second con to be mentioned is the height of this tank. This tank is really tall, and taller than a lot of the tanks I currently own. This is subjective, but still has to be mentioned. The next con to be mentioned is that some 510 drip tips may not look great due to the design. Like said previously, where your 510 drip tip sits, it is not flush with the top section of the tank. 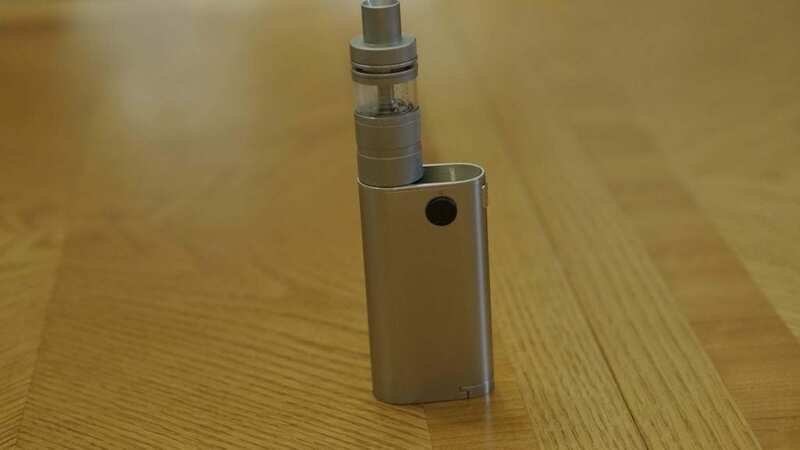 Honestly, I’m not sure why they designed it like this, as many vapers have complained about other tanks similar designs. Another con is the airflow. Once again this is subjective, but vapers who like tons of airflow may not like this RTA due to its restricted airflow. Lastly, a subjective con is the dual glass design. I honestly see no purpose to it really, as you can take out the outer glass and vape with no issues. To me, it looks just fine, but others may not like it. Even though there are some cons to the Uwell D2, this RTA still performs quite well, which leads me to the next section, the conclusion! In conclusion, the Uwell D2 RTA is a solid performing flavor RTA. Honestly, I feel that this tank is definitely designed more for flavor than vapor production. The vapor production is still great, but not as great as some other RTAs that offer more airflow and bigger build decks. However, the flavor is just amazing, and that’s what really draws me towards this RTA. In addition, the airflow is perfect for the way I prefer to vape, and it’s extremely smooth. It has no trouble with wicking once wicked properly, and filling this tank is quick and easy. I personally like the way this tank looks, and it does look different in comparison to most other RTAs on the market today. In addition, the quality of the Uwell D2 is outstanding. Uwell really did a great job with their first RTA, and I can’t wait to see what they have to offer next! With so many RTAs on the market, it really is difficult to choose one. However, if you’re looking for a great flavor chasing RTA, then the Uwell D2 RTA is an atomizer I highly recommend! I have been looking for a nice tank with top airflow for use outside of the home. What kind of wattage were you running with the this tank? My wife usually prefers single coils but I may be able to make this one work with the right build. Typically between 50w and 65 with a dual Clapton build with a resistance of 0.3 ohm. I’m sure I could of taken it higher, but at that wattage range I got a satisfying vape. With a normal round wire build, I could easily vape it between 40w and 50w and be satisfied with the performance. Hope that helps!